Words are wonderful. They have a long life. Even centuries cannot fade their charm. From leather, cave walls, leaves, all the way to papyrus and the modern day paper, words are loved, cherished, admired and awed- they play wonders. Time stands still- such is the power and beauty of words. You can see them, touch them and get touched by them- on paper, on your iPhones, your iPads and many other devices. Words are the citizens of a unique world. If we want to know them, if their different forms and shades enchant us, we need to visit their world. 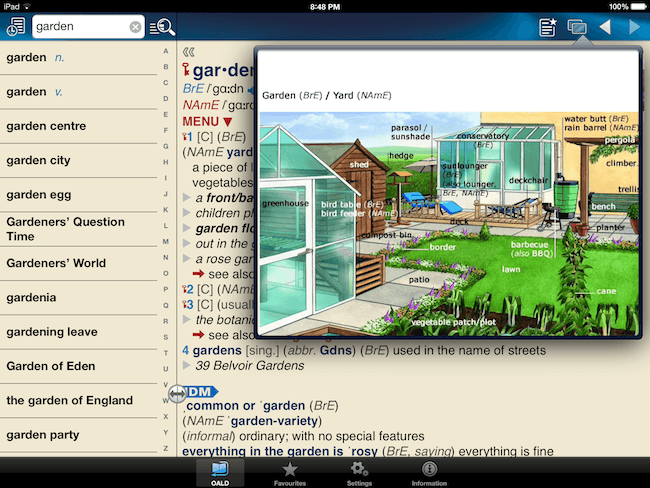 Of course, there are many tour operators, but for an iPad user a great way to land in the wonderful world of words is through Oxford Advanced Learner’s Dictionary - an iPad app. The app includes all the entries from OALD (8th edition) and entries from the Guide To British And American Culture and some extra information about words including verb forms, origin, synonyms, collocations, grammar points and example sentences. With 184500 words and phrases, 57000 synonyms and opposites and 83000 collocations besides a number of illustrations, rich grammar of verbs, nouns and adjectives, coupled with real British and American voices speaking the words and example sentences, it is a learner’s treasure trove. 1. Simple Search - just start typing, and tap the word of your choice as it appears in the index. Displays suggestions if a word is incorrectly spelled. 2. Full Dictionary Search - allows the learner to search for words within the dictionary entries. Displays results in more context under the headings Headwords, Phrases, and Examples. 3. Wildcard Search - allows searching for words containing particular letters, inserting ? or * for the letters replaced. 4. History - displays a list of recent searches. 5. Illustrations - that relates to a word, e.g., garden. 6. Extra Information MENU - extra information is organized under different headings such as collocations, thesaurus and synonyms, vocabulary building, culture, British/American (usage), etc. To identify words that express a particular attitude, the dictionary uses a rich set of labels such as approving, disapproving, figurative, formal, humorous, literary, etc., a very helpful feature for the learners of the language. OALD uses a symbol ( a key) to indicate words that are on the Oxford 3000 list of important words. These 3000 words have been carefully chosen and are the most important and useful words to learn in English. They are the most frequent words commonly used across a range of different types of texts. It also includes words that are important and are very familiar to most users of English, although no that frequent such as words for parts of the body, etc., an important feature from learners perspective. Some entries contain the symbol AW- indicating that they are on the AWL; a list of words that are likely to be met during studies at English-speaking universities. A very useful feature for learners. OALD explains the use of verbs and their types such as transitive and intransitive verbs, the kinds of objects they can take such as a noun, a phrase or a clause, preposition and adverbs that they can be combined with, etc. The dictionary is rich in explaining the grammar of nouns and adjectives as well, something a learner is sure to find helpful. Idioms and Phrasal Verbs (aka multi-word verbs) are also clearly marked using the symbols IDM and PHR V respectively. The grammar of Phrasal verbs is also covered in reasonable detail. A folder that you can create to have your favorite words. Very beneficial if you want to own and master new words- a ready list will just be a tap away! On-device (in-app) real voices pronounce words, both American and British. A great feature if you are off the grid or going through the grinds of slow internet. On-device (in-app) real voices speak example sentences both American and British. (if you opt to download them- they are a whopping 430 MB each!). You can change the background color, text size and highlighting options. You can adjust the level of depth as well by hiding some details such as pronunciation, synonyms and antonyms, pictures, etc. ; a good way to avoid information overload. AWL at one place- this will be quite valuable for those new to the English medium schools/ universities. The Oxford 3000 at one place- a big plus for people new to English. Frequent addition of new words as they become more common e.g., skyping, texting, twerking, etc. ; a must to speak the language of today. Stronger support for the American English, presently it is a little biased towards British English. Overall, this is a great app, however, the price, US$ 29.99, is rather a little on the higher side. If you are not in a rush then wait for the sale- I got it for US$14.99, definitely a good bargain.